Chinese economy has taken a major step in consolidation of its industries across the all segments. This is very positive step for the global economy as china’s excess capacity was dumping goods across the globe. Many reports and filings have been done on the table of WTO by many countries against china for its dumping of goods. China even leads major slow down of production due to its cheap import of goods. Finally china took the decision of consolidation. But this consolidation will lead to significant slowdown in the Chinese macro economy which will be reflected not only on Chinese economy but also on the global economy in the coming days. China will face and will make the world also face some very tough days as consumption and gross fixed assets formation and demand comes down. If another recession comes china will not find avenues for growth as there is hardly any space to deploy stimulus or QE. Its time for relook on the business strategy in China and the type of investments and returns one should expect from the same. Further the shadow banking might get exposed which will create a down fall for the global economy. In between their are many economists who will argue that China has enough treasuries to withstand slowdown. Well in that case get ready for redemption and markets will fall like pack of cards. One of the biggest blows will go to consumption sector which have been the key for the companies who opened their shops in china as well for the country itself too. As consolidation of industries happens employees and labours will get unemployed. This is the key place where consumption will decline and when around 3 million or more than that numbers of employees will be unemployed then this will spook significant drop in consumption. Many US subsidiaries are there in china who will find drop in sales and revenues in the coming quarters. Further people will be more inclined for savings rather than for investments or consumption as job market uncertainties will rule them. Many economist will argue that they will change their job lines but its not so easy as their an involvement of an significant level of skill for change over. Secondly when the Chinese economy is struggling with stock market collapse and slow down I find these unemployed people will add more fear among the society and will give a strong lesson to the others which will compound the slowdown of the consumption pattern. The government has announced that it will come up with packages to support the slowdown but the fact is that will not spook consumption within the economy as people will be uncertain about new job opportunities and how long the current crisis of consolidation will rule. 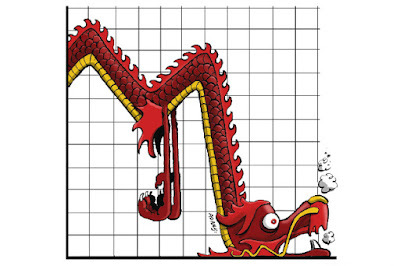 Chinese economy will face more hardships in the coming days as its massive pool of labour is going to rest. Now with consolidation of industries new manufacturing and ancillary machines, spare parts, and new investments into fixed assets will decline. As new fixed assets formation declines there will be a significant slowdown in those industries which will affect on wages growth in the near time. This will further accelerate the consumption slow down and will widen the income inequalities. People will be more inclined to save rather than going for investments. It’s a wild fire which is silently going to catch the global economy. Debt levels has also piled off in the corporate china which will take a toll on the economy once the slow down grows. China’s total debt rose to a record 237 per cent of gross domestic product in the first quarter. Real estate investment accounted for more than 14% of GDP in 2015, and this slowing growth has put downward pressure on the entire economy. Beijing has turned to massive lending to boost economic growth, bringing total net debt to Rmb163tn ($25tn) at the end of March, including both domestic and foreign borrowing. Now those who are betting that china have enough surplus of foreign treasuries to support its fall then be prepared to witness massive sell of the markets once that situations come alive. Its being found that over the last 2 decades china has created a mess of over capacity it’s now getting ready for paying the price. I find that income inequalities will widen up in china from this consolidation phase and this will kill the growth of the china as its being expected in 2016 and 2017. We will witness slowdown in the Chinese economy and this will spook overseas investments by china rather focusing on domestic investments in china. Obviously when consolidation is the key buzzing word investments within the economy will decline and will look for opportunity in the other countries. I feel pity for the Chinese people as they have been guided wrongly by creating excess capacity in all industries which is not required over the next decade as the world is also busy in creating excess capacity. A very critical analysis on fall out of BREXIT by the author.